Wright was only twenty-eight when he began teaching at the University of Texas School of Law in 1955. 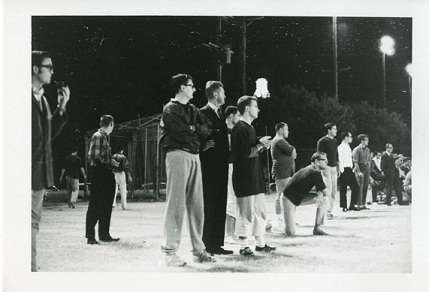 When a first-year student announced that an intramural football team was being organized, Wright, who played end for both his Haverford, Pennsylvania High School team and Wesleyan University in Middletown, Connecticut, asked whether faculty could participate. Invited to be both player and coach, Wright accepted and christened the team the Legal Eagles. After five seasons, he restricted his involvement to coach, but never wavered in his enthusiasm for winning. 1. The team is not a debating society. Do not argue with referees. 2. There should be no unnecessary penalties. 3. No one on the team stops until the whistle blows. On multiple occasions, Wright took visiting professorships that kept him from the team for a year though he regularly returned for the Beer Bowl and carefully followed the team's progress. When Wright assisted President Nixon during Watergate, the White House switchboard had a standing order to put calls through from the interim coach after a game. In 1991, Charles Alan Wright appointed himself Athletic Director, naming Professor Tom McGarity as head coach. McGarity, a Legal Eagles player in 1973, has taught environmental law at the Law School since 1981 and had served as assistant coach of the team since 1980. After Charles Alan Wright's death in 2000, Brian Rider, an adjunct professor at the law school since 1998, became Athletic Director of the Legal Eagles in 2001. During Wright’s 45 years as head coach, the Legal Eagles had 330 wins, 44 losses, and 5 ties. Their longest winning streak was 40 games and the longest losing streak kept to a single game. Additionally, during Wright’s tenure, the Eagles won 27 of 35 Law-Grad Division championships and 7 of 14 All-University Championships. Original photographs featured in this exhibit are part of the Charles Alan Wright Papers. Larger images are linked when available. If Eagle Exes have team photographs or candid shots of the Legal Eagles, we would appreciate a digital copy to add to our collection. Statistics and scores have been taken from Charles Alan Wright's records and may be incomplete. We would welcome any additional information on scores or schedules from former players. Photos or additional information may be emailed to archives@law.utexas.edu.